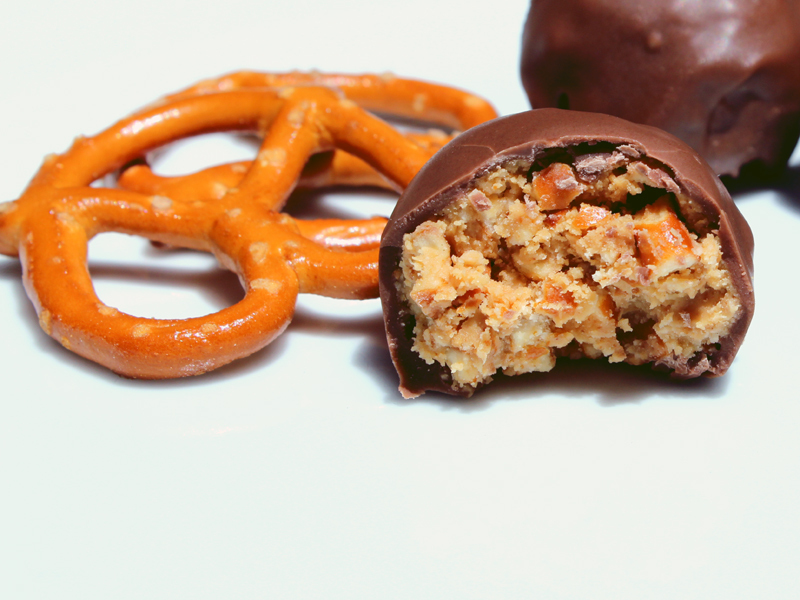 Happiness Project Recipe #12: Chocolate PB Pretzel Niblets! Break out that apron again! You’re going to need it for this one! In a medium sized mixing bowl (with a paddle attachment if on a stand mixer), stir together the peanut butter, confections sugar, butter & crushed pretzels until well combined. You can easily do this by hand with a wooden spoon if you don’t have a stand mixer. Quick tip: Place your pretzels in a closed ziplock bag while crushing them up. Clean up is easier this way. Plus, your kitchen will thank you. Roll or firmly pinch your mixture into 1 inch balls & arrange them on a parchment or Silpat lined baking sheet. This should make you about 24 pretzel balls. Freeze them for 30-40 minutes until firm. Before you take your semi-frozen pretzel balls out of the freezer, melt your chocolate candy in a microwave safe bowl on high for about 1 minute, stirring at each 30 second interval. Using a large fork or spoon, dip each ball into your bowl of melted chocolate, gently tapping the fork or spoon on the bowls rim to remove excess chocolate. Deposit your covered balls onto your lined baking sheet & chill in the fridge until the candy coating is set before serving. If not serving immediately, keep them in an airtight container for up to 3 days. Happy 4th of July, my friends! And happy nibbling! « Happiness Project Recipe #11: Saturday Morning Lemon-Poppy Seed Muffins!